Can crimini mushrooms and vegetables help you beat MS and CCSVI while making you look this good? The science looks promising. At the very least, when the mushrooms and vegetables help keep your blood vessels free of plaque, they will help give you a healthy glow. Crimini mushrooms and vegetables do look promising for those with multiple sclerosis (MS). Research shows the mushrooms have a couple of effects that are likely to produce some good results for those with MS. Even so, a smart approach to using the mushrooms involves combining the mushrooms with other health enhancing vegetables as discussed below. 3-one and published in 2008. In that study, researchers from Japan explained that the crimini mushroom, which has a scientific name of agaricus bisporus, contains a compound that “can down-regulate the inflammatory cascade that can lead to tissue and bone destruction at sites of inflammation”. The scientists suggest that this compound may prove useful in the treatment of autoimmune diseases such as multiple sclerosis. The article is difficult reading but the above link takes you to the full article. The second fascinating effect of crimini mushrooms involves their ability to protect against cardiovascular disease by helping prevent adhesion and plaque buildup in the blood vessels. This ability was discussed in an article published in 2010 and entitled Both common and specialty mushrooms inhibit adhesion molecule expression and in vitro binding of monocytes to human aortic endothelial cells in a pro-inflammatory environment. This report is a little easier to read and the link again takes you to a full text article. In any event, it is apparent from the article that if you are worried about any blood vessel problems that have long been linked to MS, crimini mushrooms can be of help. This second article also contains some other interesting facts for those thinking about MS. The article points out that phytonutrients contained in leafy greens such as kale, spinach and leaf lettuce; in yellow vegetables such as carrots and yams; and in red vegetables such as tomatoes also have potent abilities to prevent plaque buildup and adhesion in the blood vessels. What does all of this suggest to those with MS? It suggests eat, eat, eat mushrooms and vegetables. If you are worried about MS, vegetables and some mushrooms might be your best friends–this is so especially since the “flavonoids limit demyelination in MS” (see an article entitled Polyphenols: Multipotent Therapeutic Agents in Neurodegenerative Diseases). It should be noted that vegetables, especially leafy greens, should be eaten at least twice a day. Some of the phytochemicals in leafy greens and other vegetables that prevent adhesion are available in the blood stream for only a few hours after they are eaten. Then, they must be replenished. The availability of phytonutrients from vegetables in the blood can be increased somewhat with extra virgin olive oil. For this reason, it is a good idea to eat a small amount of olive oil when eating vegetables. This new information on mushrooms and vegetables makes sense in light of previous epidemiological studies that showed eating vegetables has a protective effect again MS.
As a footnote, please note that based on the information, a few of us conducted our own little rather unscientific pilot study — we called it theory building. We dutifully ate leafy greens two times a day and ate generous quantities of mushrooms for one week. We also made a point of eating yellow and red vegetables each day. (I steamed my mushrooms for a few minutes.) The first day, I ate about 1/2 pound of mushrooms and thereafter I ate about 1/4 pound each day. I used both the standard crimini mushrooms and portabella mushrooms which are more mature crimini mushrooms. Those of us who tried this little experiment thought we had two outcomes: (1) we felt more alert and (2) we thought we slept more soundly at night. I personally felt I also had a small increase in fine motor skills. All in all, vegetables are an exciting and overlooked way to increase our wellness. 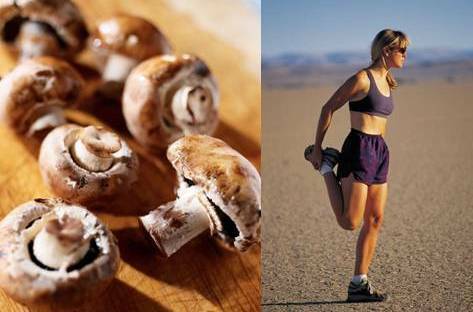 Please try out eating more mushrooms and vegetables and let us know if they give you a boost too. It is interesting that the Japanese, who have very little MS, eat about 19 pounds of mushrooms each year. In contrast, most in the west, where MS is common, eat only one or two pounds of mushrooms each year. It has long been known that the vascular system does play some role in MS. If you are worried about MS or about blood vessel problems that have long been discussed in conjunction with MS, based on more recent research, it makes sense to eat more of the protective vegetables discussed and mushrooms. When you try eating leafy greens two times a day and add a some mushrooms, please do let us know the result. Perhaps we can push the MS societies for some real trials that nail down all of the facts on mushrooms and MS.
Viva la healthy living! Remember: nothing will make you look drop dead gorgeous faster than following an MS diet and an ultra healthy lifestyle. You need to get in touch with Dr. Terry Wahls, in Iowa City, Iowa, who is doing some research on the nutrients affecting the course of MS. She has a Facebook page. Also, get her book, Minding My Mitochondria, from amazon.com it’s about $31 and has loads of recipes for the above mentioned leafy, red and yellow vegetables. Terry was in a wheelchair and now rides her bike to work. You will be amazed if you read her book, and she is very approachable and interested in people with MS who are trying to modify their diets in an effort to control their symptoms and the progression of their MS or other CNS problems. Thanks for your comments on Terry Wahls, M.D. I actually have been aware of Wahls for a long time and have had a link to one of Wahls’ slide presentations on this web site for a long time. If you look under the “Great Web Sites and Books” section, you will see the link to Wahls’ presentation. I also have introduced many with MS to her on Facebook. I do not agree with every detail presented by Wahls but I am delighted to see Wahls speaking out on in the need to address nutrition in those with MS especially when I agree with so much of what she says. When about 70% of those with MS are malnourished, nutrition is definitely the place to start! I hope you too will join us in encouraging others with MS to pay attention to nutrition and lifestyle factors. Everything we can do to educate, reach out and advocate is a step ahead! It will take all of us to change the way MS is treated in the world and that is what we need to do! At some time in the future, I hope to see the Internet flooded with web sites talking about lifestyle and MS and the way we can overcome MS using a science-based approach that appropriately uses simple things like eating vegetables, correcting malnutrition, and avoiding saturated fat. Thanks again for stopping by and for leaving a comment. I tried this in 2007, after months of fatigue and it took a couple of months, but the effect was nothing short of magic. However, you need a juicer and a high powered blender, which are expensive. I don’t go out of my way to avoid saturated fat, but I never eat processed foods. As with MS, we are all different. I have a high risk of diabetes (type 2) and have to eat a low carbohydrate diet, so I follow a Paleolithic diet. The green smoothie habit has stayed with me and I love mushrooms. Kale is difficult to digest, but the high powered blender does make it a little more digestible. It’s always worth a try. It turned around my MS. A drastic diet, but with excellent results. I am having trouble finding the crimini mushrooms. Would baby bellas also work? Also, I have been drinking low sodium V-8. Do you think it can be helpful as well? I just like the taste, but it has tomatoes, carrots, celery, beets, parsley, lettuce, watercress and spinach. It is not organic, and therefore not ideal. Just wondering. Baby bellas would help too. V-8 juice is not as good as fresh veggies that you use in a salad or smoothie. Of course fresh and organic is ideal but just fresh is second best. Third best is frozen. Canned veggies are fourth best. I’m glad you are getting lots of veggies. I think we defintely feel better when we eat them. I certainly feel better when I eat well! Hi Rebecca can you tell me more about your above statement “I do not agree with every detail presented by Wahls”. What don’t you agree with? Her idea that range fed red meat can be eaten regularly in a healthy diet (I think red meat from beef, pork, etc., have far too much saturated fat for those of us with MS and even for the general population). Her idea that the eating of organ meats is needed (liver has a lot of saturated fat and I think it is not a necessary part of a healthy diet). The idea that coconut oil is healthy (the research does not support this view at this time). The idea that eating of a lot of sulfur rich vegetables is needed (many, including myself, have problems with sulfur and cannot and should not eat the amount of these vegetables recommended by Wahls). The idea that legumes and grains should be eliminated from the diet (those who live the longest in the world regularly consumes legumes and grains and those I know who do the best with MS also eat these foods regularly — the research does not support Wahls view on legumes and grains). The notion that various of a rather long list of supplements are beneficial (the research shows that many supplements can actually cause harm and for this reason I take very few supplements). In general, I think that eating healthy and eating whole plant food and fish is optimal while, of course, any foods to which one is sensitive or allergic must be eliminated. Wahls on the other hand, thinks the meat oriented Paleo diet is optimal. The Paleo diet came from the Stone Age and I think many humans have improved their diets since that time when most died quite young. It is important to note that Wahls’ improvements may have come from some of her diet improvements and her initiation of an exercise program. These two factors would help most. Her improvement, however, may not be as good as it could be if she followed the type of diet that most scientists thinks prolongs life and promotes optimal health. I think Wahls would do better if she improved her diet using the recommendations made by Professor George Jelinek, M.D. I think that Wahls’ advocacy for a diet including more vegetables and exercise is important and the research does support the view that improved diet and exercise can help with MS — even those who have progressive MS. Wahls’ case does help emphasize the point that there is a lot of hope for those with all types of MS and this, I think, is the most important point we can take from her case. I think that those with MS can do even better with a whole plant food and fish diet than they can do with the diet recommended by Wahls. MS runs in both sides of my family. My brother has it as well as my wife’s brother and his son. I just happened to be reading about the health benefits of kale at https://factualfacts.com/kale-health-benefits/ but there was no mention of it being potentially beneficial for people with MS. I am not that crazy about kale but my wife has picked it up a few times and even tried making “kale chips” by baking it in the oven but I thought they tasted terrible. In any event, it looks like it might be something I should spread the word about in case my brother or brother-in-law want to give it a try.